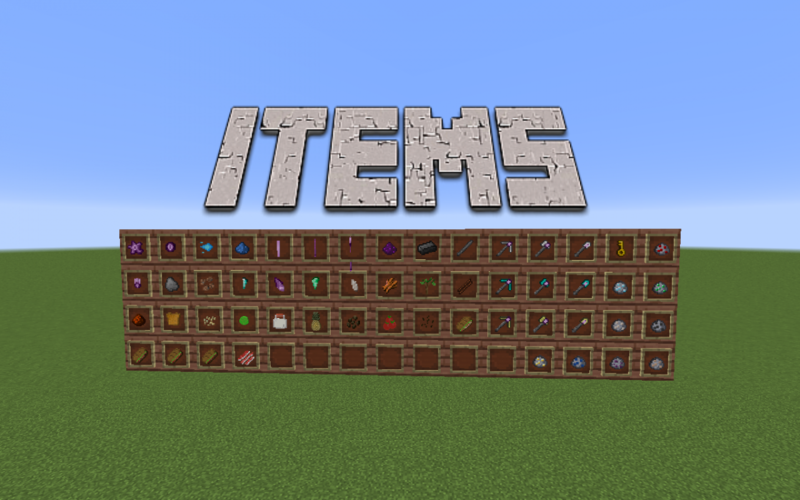 This mod adds many useful and fun items to Minecraft, plus it is designed to allow you to add upon it. Feel free to suggest new additions and don’t forget to call out any bugs. A refined version of its raw form. You can get this gem by melting four Raw amethysts in a melter. When doing so it will give you two Amethysts. This is the handle and first part for the different staffs. You can get it by melting two of there Prong variants in the first and last slots of the melter. In return, you will get one Handle. A sharp spike of amethyst. It is used to make the amethyst handle and the amethyst staff head. You can get it by melting two raw amethysts in the first and fourth slots in the melter. This gets you three. Diamond, Ruby, Gold, and Iron prongs A sharp spike. It is used to make the handle and the staff head. You can get it by melting two gems (ex. if diamond put a diamond here) in the first and fourth slots in the melter. This gets you three. This head is the second part to the different staffs. You can make it by putting three of there Prong variants in the first through third slots of the melter and one gem (ex. if diamond put a diamond here) in the fourth. This gets you one staff head. From this you can make the ammo for the amethyst staff. It is made in the crafting table by putting five gunpowder in an X formation and light blue die in the rest. This gets you nine blue powder. The gold key is used to make a regular bookshelf able to hold books. It is made in the crafting table by putting two gold nuggets one above the other in the top two rows and to there left a collum of three gold ingots. This rock is used to make cinnamon and infused iron powder. It is made in a crafting grid by placing in one cobblestone. When used in a crafting grid it is not used up. This is used to make the infused iron ingot. To make this you need one iron ingot, one raw amethyst, and the grinding rock. Put all of these in a crafting grid and you get infused iron dust. This is used to make the infused rod. To get this you need to smelt down one infused iron dust. Once made it is used to create the amethyst tools below. To make it you need three infused iron ingots in a crafting table one on top of another. This can be melted into amethyst. To get this gem you need to mine some amethyst ore.
these are dropped by their reed variants and can be smelted into either the ore drop, shard or nugget. Amethyst, Diamond, Emerald, Ruby, and Quartz shard these can be obtained by smelting the pulps above. they are used to create their whole variants and to create their reed variants. this is used to create the Giant hermit crab armor and is dropped by the hermit crab. hermit crab shell this is also used to create the Giant hermit crab armor and is dropped by the hermit crab. Village finder This item helps you find the traveler's village. It is crafted by placing four emeralds around a compass. Scorpion breast plating this is used to create the scorpion armor and is dropped by the scorpion. this is dropped by the scorpion and is used for crafting the scorpion armor and the scorpion sword. this is dropped by the panda and can be used to make the panda armor. this gem is found by mining. A more compact version of the amethyst. Placing nine amethysts into a crafting grid creates it. This block allows you to teleport to wherever the last home teleport block was right clicked. It is crafted with a diamond in the middle of a crafting table. And some stone bricks all around except the top middle where there is a magenta carpet. This is the basis of all amethyst things. This is the ore that drops raw amethysts. It can be found from y level 25 to y level 5. The Melter is what you make amethyst stuff in along with the amethyst staff projectiles. It is crated in the crafting table. First, you put a water bucket in the bottom middle. Then you put two lava buckets in the middle row on either side of the middle. After this, you need three empty buckets one in the center of the table and two in the upper two corners. The slots that are still empty need to be filled with stone bricks. The leafy bit to the cinnamon tree. The placer helps you by placing or breaking things automatically with a Redstone signal. Currently, it only places sand and picks up cobblestone. (Upon request I will think about adding More blocks). The uses for it right now are clearing water and creating automatic cobblestone generators that don’t need you to be there breaking blocks. There is one bug though. It can only hold one cobblestone block at a time so a hopper and chest will be needed. This block is created in the crafting table by placing a piston in the center and Redstone dust below it along with andesite in the remaining slots. This is a normal world version of the nether quartz ore block. It can be found in the world and drops normal nether quartz. Any wood type needs some planks. This is the block that is created when you strip a normal cinnamon log to get cinnamon sticks. This plant grows the cinnamon tree and can be found by destroying grass. The trade center is where you can trade with the traveler. It can’t be crafted. It can only be found in the traveler’s house. The half version of the cinnamon plank. This bookshelf can both store books and power an enchanting table. Right-clicking a normal bookshelf with a gold key makes the work. This crusher grinds different blocks into their smaller counterparts. Stone to cobblestone, cobblestone to gravel to flint, sandstone to sand (red and normal), melon blocks to melon slices, coal ore to coal, Redstone ore to Redstone dust, diamond ore to diamonds, and more. You can craft this in a crafting table by placing a hopper in the top middle with Redstone on the left and right. The rest is iron in the remaining slots leaving the middle of the crafting table empty. these slabs can be made by putting three logs across the middle row of the crafting table. Glass slabs all of the colors are in this mod but only a few have recipes. 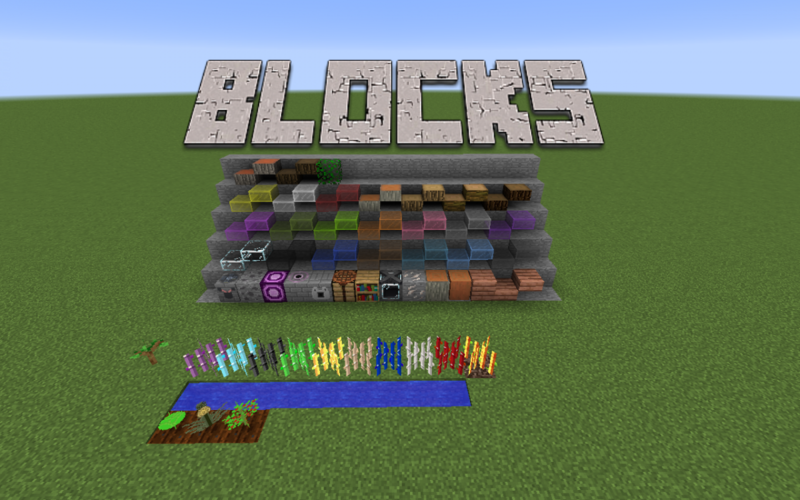 (this will change in 1.0.2) Bamboo This is a purely aesthetic block. it can be converted into its plant variant seen in the plants section of this description. this version can be acquired by breaking a bamboo stalk in the bamboo grove biome. Ruby ore mine this to get rubies. Ruby Block this is crafted with 9 rubies. This super strong long-range weapon kills most mobs in one hit. To use it you will need some blue power balls. It works similar to a bow. You can make this using the Melter. An amethyst staff head goes in the first slot while an amethyst handle rests in the fourth. This tool has been upgraded with an amethyst and an infused rod. This gives the tool 2000 durability and a much higher enchanting rate than even gold. This is the ammo for the amethyst staff. It is made in the Melter by putting one blue powder in each of the four slots. This will get you two Blue power balls. This tool has been upgraded with an amethyst and an infused rod. This gives the tool 3000 durability and a much higher enchanting rate than even gold. This pickaxe can break bedrock by right-clicking though it does not have as much durability as when amethyst is used to upgrade the normal tools. it is created through the crafting table in the shape of a normal pickaxe through the handle is the infused rods and on top of these an amethyst. on both sides of the amethyst are two amethyst prongs. Diamond, ruby, gold, iron staffs these are not as powerful as there amethyst counterparts but some come close. This is ground up cinnamon sticks. This is used to make French toast. It is created in a crafting table by placing the grinding stone on top of a cinnamon stick. This tropical fruit has a nutrition value of 4. It can be grown using pineapple seeds found by breaking grass. This can be ground up into cinnamon. You get it by right clicking on a cinnamon log with an axe. There are four types of these chicken, beef, mutton, and pork. All of these have a nutrition value of 12. They can be crafted by putting a piece of meat in the center of a crafting table with bread above and below, lettuce to the left, a tomato to the right, and some mayonnaise on top of the tomato. This food has a nutrition value of 7. To craft it in a crafting table you need one piece of bread on top of a bucket of milk, an egg, and some cinnamon. When crafted it gives you four of these delicious treats. This food has a nutrition value of only 3 but that is increased when it is used to make a sandwich. It can be grown using Tomato seeds found by breaking grass. This food has a nutrition value of only 2 but that is increased when it is used to make a sandwich. It can be grown using lettuce seeds found by breaking grass. this food has a nutrition value of 2. it can be obtained by killing crabs. (right now the only way to kill the crabs is by suffocating them. since they can't move you just digg two blocks below them and then place sand on top. the meat will apear on top of the blocks. Cooked crab meat This is the cooked version of crab meat. it has a nutrition value of 4. it can be made in the furnace by cooking crab meat. bell pepper This vegetable has a nutrition value of 4. It can be grown using Bell pepper seeds found by breaking grass. It can be grown using Tomato seeds found by breaking grass. Fire reeds are found in the nether and when cut down and put into a crafting table you get blaze rods. It can be grown using pineapple seeds found by breaking grass. This tree is the basis for cinnamon and French toast. It does not naturally grow in the world yet but its saplings can be found by breaking grass. It can be grown using lettuce seeds found by breaking grass. These reeds cannot be found in the world. they have to be created through the crafting grid. you can do this by placing a sugar cane and a shard (amethyst, diamond, emerald, and Quartz) or a nugget(gold and iron) or the item itself(lapis, redstone, and coal). Bamboo Plant this tall plant grows in the bamboo grove biome. it grows 16 blocks tall. it can be made by mixing the non-growing bamboo and water. This mob, when found, does not move unless pushed. Though you can trade with him to get things that he has found. (His story of all his adventures will be implemented in a future update so feel free to suggest.) 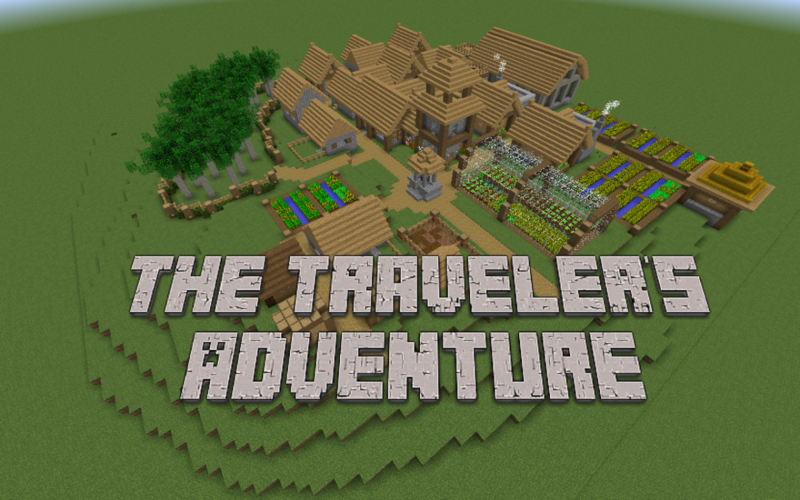 Travelers can be found in their houses that spawn anywhere grass is found. In his house, there are some secrets (not all have been implemented as said before) as well as the trading center. The scorpion is a passive/aggressive mob like the pigman. it spawns in desert biomes. it does not drop anything special yet. Giant hermit crab helmet This armor is made from crab breast plating in the shape of the normal helmet. along with a hermit crab shell in the center. below this, you will need a leather helmet. Giant hermit crab chest plate this armor piece can be made like a normal chest plate out of crab breast plating. the only differences are that there is a hermit crab shell in the center and leather chest plate in the spot left over. This is a special village custom made by hand. this will eventually be the heart of this mod. 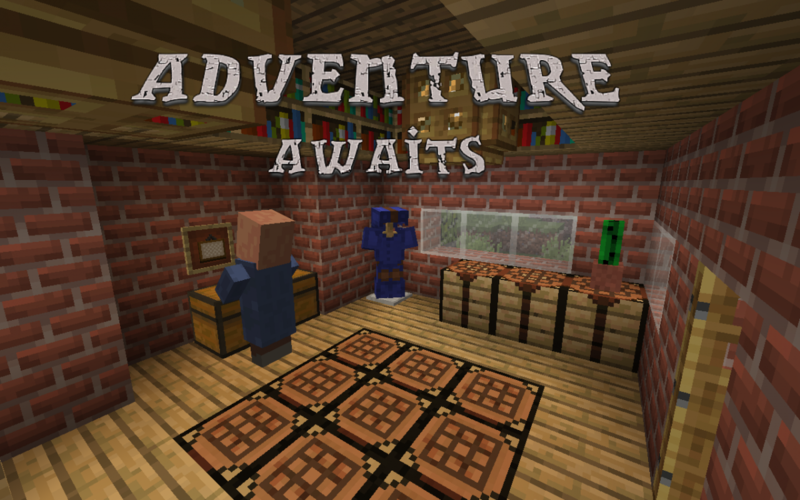 the place where you will be able to find recipes and mod instructions. this village does not spawn in on its own. You don't get to choose where it loads either. It needs to be spawned in at the beginning of the world (right after the world loads for the first time). to spawn it in you will need to perform 16 commands so cheats need to be enabled for this but they can be disabled later. First of type the command //previll. This will prep the area it spawns in. the next few commands are very similar, they each start with //vill then after this comes a number (example: //vill1 or //vill15). you will want to do each of these only once. Type them in this order //vill1 //vill2 //vill3 //vill4 //vill5 //vill6 //vill7 //vill8 //vill9 //vill10 //vill11 //vill12 //vill13 //vill14 //vill15. And then you are done and ready to find the village in your world It spawns at the same place every time you load a new world so keep that in mind. Might be added in future: (feel free to suggest new things as well as modifications to pre-existing things) all below are concepts. [bug fix] Quarts spawning was too high and was replacing iron, cole, and ores in other mods. [bug fix] tomato plants no longer replace grass. Thanks for letting me know. I had not thought of the axe having a different damage amount. Also I have tried to create custom mob models but I can’t get any of the applications for Mac to work. If you make the model and animation for the animals I might add them. If this happens I will put your username in the description as a contributor. Also I just started my college classes for this school year so there won’t be as many updates. Thanks for telling me about the quarts. I will lower it in the next update. I am not shure what exactly you are meaning by this comment. That was for the models and textures.